The last interesting iPhone dock we reported about was the MiLi HD which enables users to transfer their most liked multimedia content to the flat screen or home theater system without any worries. iFusion has unfurled its first integrated communications docking station for the remarkable iPhone dubbed Smart Station. The offering flaunts handy Bluetooth technology, a full duplex speakerphone and a patented ergonomic design. It promises to enhance the entire user experience by delivering advanced voice quality. 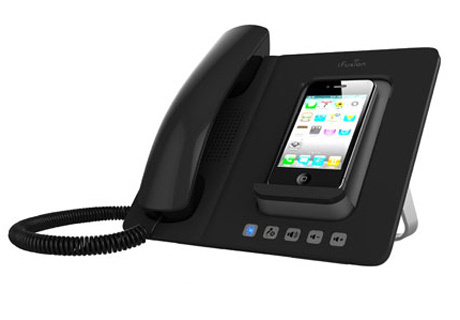 Designed with a neat cradle design, the device lends support to the iPhone 4, 3G and 3GS. The newest entrant accommodates the Apple smartphone with utmost comfort. Further, the docking station delights users with power, battery and seamless data synchronization using an incorporated USB cable. It supports A2DP Bluetooth streaming, thereby allowing users to enjoy their iPhone music collection using the internal speakerphone. This new iPhone docking station is expected to ship in April 2011 and can now be pre-ordered from the official website for $169 (approx Rs. 7,762).